One of the factors that contributed to so many geoglyphs being undetected prior to the aid of satallites is their enormous size. According to leading geoglyph scientist Alceu Ranzi, his latest discoveries — five sets of geometric shapes, with circles, squares and lines — can measure more than a mile from one extreme to another. 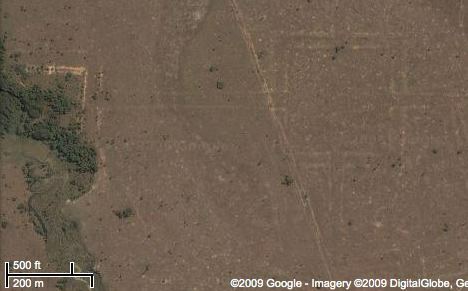 Treehugger doesn’t provide locations of examples of these geoglyphs, but Globo Amazonia does. For the sake of convenience, here they are on Google Maps — click here to see them on Google Earth.